The Clutch Performer combines function with fashion. This striped clutch set set includes one large and one small clutch — both perfect for everyday use or on special occasions. Personalization options: We’ll embroider with up to three initials for no extra cost (initials will be the same on each clutch). 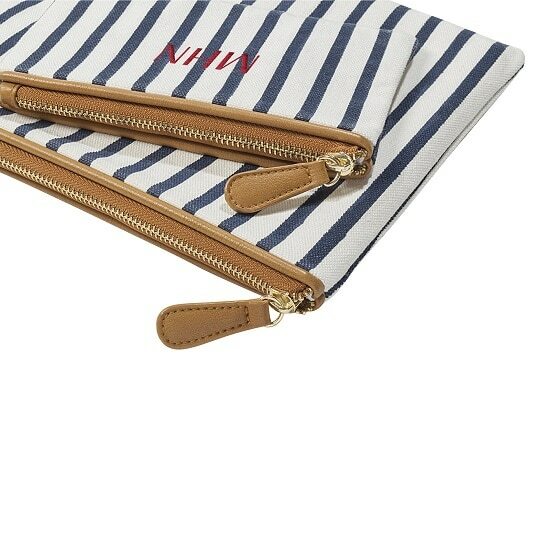 Combine function with fashion and gift your bridesmaids with our Personalized Striped Clutch Set. Featuring a chic, blue and white striped design and a zipper closure, each bag in the set is also accented with classy faux leather piping. The large clutch is great for a special occasion or night out, while the smaller bag keeps your smaller items organized. Adorn each with a letter or three block initials at no additional cost (and in a selection of thread colors) and make this gift truly special for the most important ladies in your life! Durable canvas material with faux leather piping.